Bells and whistles. Home pages that make people click through. Our web design is just that irresistible. Tom & Co. will have your web page become the major conduit the consumer will have for interaction with your brand. Simply having a website adds legitimacy and credibility to your business. Having a well designed website, on the other hand, adds appeal and generates a positive attitude that will make customers that much more inclined to use your business. We won’t stop designing until your website is a perfect match for your business. 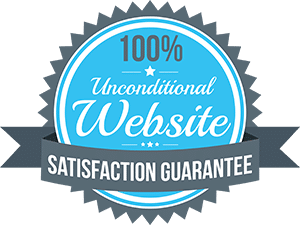 All of our websites come backed by our 100% satisfaction GUARANTEE! The sole purpose for your website should be to attract, capture, and convert your ideal prospects into clients who pay, stay, and refer. Behind all of that, we have the experienced coding experts that make for a smooth running and efficient website. Tom & Co.’s 100% custom web design will capture your audience‘s attention with our modern look and clean functionality. And don’t worry… we won’t charge you extra to add a touch of our sparkling humor to the page. We guarantee that you will love your finished site. Notice a little issue you want modified? We pride ourselves in our high standards and our customer satisfaction and we will not stop working until the site meets your approval. Read more about our 100% Money Back 60 Day Guarantee. This means they have to be able to find your website in the first place. If your prospect is searching for you today, does your website show up on the first page of Google for the keyword search term they are looking for (NOT the name of your business)? If you aren’t on the first page you most likely wont be found. We can fix that. We’ve got more than a few SEO (Search Engine Optimization) tricks up our sleeves. Even if your current website is drop-dead gorgeous, it means nothing if it doesn’t pop up on that crucial first page in Google. We will ensure that your website is decked out with SEO triggers that will help place your site at the top of search results. It has to be custom-made. We believe every website should be unique and tailored to the business. This means color scheme, copy, and layout should form a cohesive consistent image that supports your brand. Want to update the content on your current site? We can handle that too! We will customize your site from whatever point you’d prefer, whether it is entirely from scratch or just a little makeover. With one interview, we will gain an understanding of your business and your business’s culture. We will conduct in-depth research to learn your industry’s lingo and we will present to you a site that will accurately and effectively reflects your brand. When it comes to websites, the marriage of functionality and style is an absolute must. What’s the point of a beautiful site if your prospect has a hard time navigating it? Likewise, a navigable site that is not aesthetically appealing won’t hold your prospect’s attention for long. We understand the importance of achieving a balance between function and style. First and foremost, a site is meant for your customers. This means the site needs to meet your customers’ needs, whether that is providing more info, scheduling an appointment, or purchasing a product. We give your site a function and then add style-making sure your site engages with the customers and keeps them on your page for as long as possible. In today’s digitized world, more and more people are using social media. This means that many of your current and potential customers are online, which in turn means your business needs to be too. Linking your social media accounts to your website is a great way to promote your online presence and allow further interaction between your business and your audience. A ‘Contact Us’ page is another crucial ingredient in making sure your customers can get to know your business a little better. Check out our Social Media Management services and don’t lose out on an opportunity to have your website tied to social media and expand your online presence. Blogs are a fantastic means to keep your site active and demonstrate your know-how of the industry. Blog posts can be shared across social media as a way to promote your site and can help your SEO. Active blogging presents your business as an expert in the field, up-to-date on the latest trends, and humanizes your brand. There are plenty of other benefits of blogging, including improving conversion rates, but the bottom line is: a blog on your site is important. It’s also a lot for a business owner to keep up with, which is why we do it for you! We consider blogging an integral part of web design and are committed to creating and maintaining a blog section on your site. Our content writers are capable of creating authoritative knowledgeable posts for any industry. Want your blog’s voice to be a little more laid back and friendly? Your wish is our command! Why should you choose us? It’s Simple! First impressions count! All of our websites are thoughtfully crafted for ultimate aesthetic appeal and support of your brand. We do the work for you! The design, the content management system – even the copy! We do everything so you don’t have to. Even if you don’t have the wording, we can do it for you with one, quick interview! Pages and images that load quickly,giving your clients exactly what they want, when they want it. Search Engine Optimized.Once we are done designing and coding your website, we spend time optimizing it for the keywords your clients are searching for so that you appear at the forefront of search results.